MS Word, MS Excel etc. I visited this centre on Saturday 2nd of August 2008 with some of young friends who are taking keen interest in the telecentre movements. The two women are recently graduated from the university of Dhaka. They are cooperating us and accompany us in the remote villages without bothering the troubles in the journey. Please keep these pictures in record. I am sending you other case studies soon and will continue to send the success and failure stories. The man in the first picture is the owner of the telecentre. He is showing us raising his hand the place where he started his activities first two years ago with just one computer. In picture SV203543, the man is explaining the activities performed in his telecentre. Now he has 9 computers, three with internet connections. He is organizing training programmes as well for different levels of educational back grounds. Editing, printing, photocopying, scanning, Faxing, emails, video conferencing, digital photography everything is done here in this remote village. The local people are getting services at a very reasonable price. They are happy. The owner showed us the new room that is going to be equipped for training 30 students at a time. Computer training – MS Word, MS Excel etc. Here is the picture of a telecentre I visited few days back. 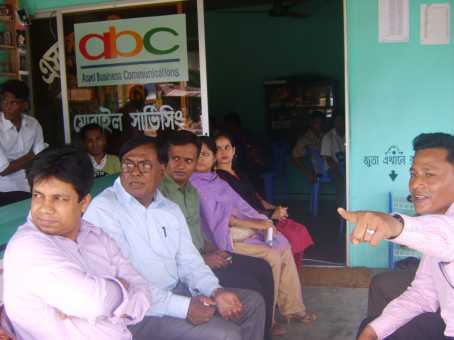 The telecentre is located in one of the remotest villages in Bangladesh. People are mostly illiterate or with little formal education. You will find three persons in the picture. I am in the middle. 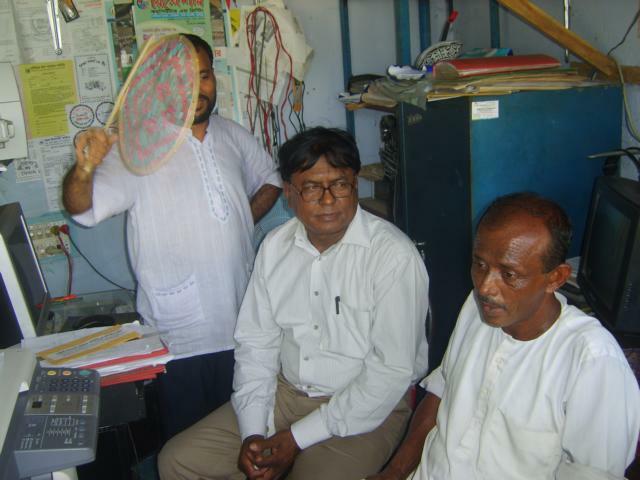 The man with hand fan is the founder and owner of the telecentre. He has finished school level education. He went to middle east and worked for several years but could not make sufficient money. He attended an IT course in the World Net. Then he has started the telecentre initially with email services, then extended the services depending on the demands of the local people. Almost 75% young generation of the region are working abroad, They are doing odd jobs there but sending their money to their parents or relatives living in the village. The man sitting by me is the father of three sons who are working abroad and they are sending money regualarly. The man seemed to me the happiest man in the region. I asked him lots of questions about the benefits they get from the telecentre. What he wanted to tell me in his local language is "Telecentre has brought him everything in his hand and he has no sufferings now". For the same jobs he used to go to the capital city and spent lots of money and lots of sufferings. I talked to other customers including women whose husband is workiing abroad and many of them have not seen each other for years but the telecentre has enabled them not only to talk but to see each other. They can not touch each other but weap sitting in two regions of the world. Telecentre is providing lots of facilities like jobs information, making applications for the people, providing different types of official forms. Photo copies, digital studio, printing, painting everything is available here. The man in the telecentre seemed very dynamic and creates new ways of applications of the telecentre. He is very intelligent as well. He is finding new ways of earning from the local people. He is giving service to the people in the localities and but getting his remunerations or charges from abroad in foreign currency. The man was so happy when we arrived in his centre travelling more than 100 kms in risky roads. Electricity was not there when we arrived. The man was fanning me. I was very much impresed on his hospitality and good behaviour. Every telecentre has different histories. They communicate each other and share their problems. The most interesting thing is "neither the government nor any NGO have any contribution for them". I am very happy to meet them, their staff, trainees, customers and village people. Let us cooperate them through sharing our knowledge that we earned from the universities or from the GTA, EUTA and so many.